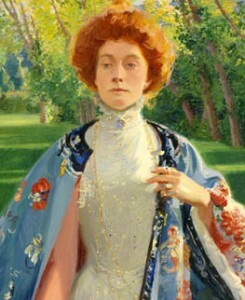 The Bennington Museum is a small museum and a perfect detour if you are visiting this area. The highlight for me was the Grandma Moses collection. Seeing the video of an interview with her, learning she started her painting career in her seventies and that she had created over 1500 works of art! Seeing the 18th century tilt-top table she painted with. 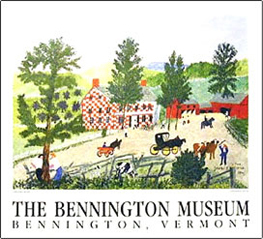 The Bennington Museum was founded as the Bennington Historical Association in 1852 to celebrate Bennington’s Colonial past and, more specifically, to commemorate the historic Revolutionary War Battle of Bennington in 1777. Over the years our mission has expanded to preserve and interpret the rich heritage of southern Vermont and neighboring regions as well as providing a venue for visual and performing arts that enriches our community and our world. Over time the museum acquired paintings and sculpture by Vermont artists, children’s toys, maps, books, and military artifacts. We are proud of our extensive collection including vintage portraits of early settlers by Ammi Phillips; our unique Ralph Earl townscape; a Windsor writing-arm chair owned by Ira Allen, a founder of Vermont and author of the State’s constitution. Bennington was a leading industrial town in New England from the mid-nineteenth century through the mid-twentieth century — at its height around 1890 it was home to nearly three dozen individual mills along a two mile stretch of the Walloomsac River. With this industrial boom came economic prosperity. The mill owners built glorious homes, and filled them with beautiful art, furniture and decorative objects. Summer residents, many from Troy and Albany, New York, brought wealth to Bennington when they built new summer “cottages” or refurbished existing, often historically significant homes. Gilded Age Vermont highlights the industrial and cultural innovation of the region during this time through objects that were either made or owned in Bennington and the surrounding region, or created by artists with connections to the area. Featured in this gallery are elaborate Renaissance Revival furnishings and a stylish parlor organ manufactured by the Estey Organ Company of Brattleboro, Vermont. Frederick MacMonnies’ sumptuous portrait of May Suydam Palmer and the Martin Wasp, a luxury automobile made in Bennington by Karl Martin between 1920 and 1924 are on view, along with paintings by William Morris Hunt and glass and metal works by Lewis Comfort Tiffany. Collectively, these objects paint a vivid picture of innovation and prosperity from Vermont’s past. Drawn primarily from items in the museum’s collection, Gilded Age Vermont is devoted to aspects of the permanent collection not cohesively celebrated in the past. On view year round is a selection of works by Anna Mary Robertson Moses (1860 – 1961), who became known to the world as Grandma Moses, one of America’s most noted folk artists. Moses began painting in her seventies and by the time of her death in 1961, she had created over 1500 works of art. The Bennington Museum holds the largest public collection of Moses’ paintings in the country, as well as “Yarn paintings”, art supplies, and the 18th century tilt-top table Moses painted with rustic scenes and used as her easel.